SHELBURNE, NS & HALIFAX, NS – Boxing Rock Brewing & Garrison Brewery have announced details of an upcoming collaborative beer that is being released as a tribute to Gord Downie of The Tragically Hip. The label of Courage will feature a version of “By the Numbers”, a design created by artist Erin McGuire that features all of the numerical references from Tragically Hip songs. 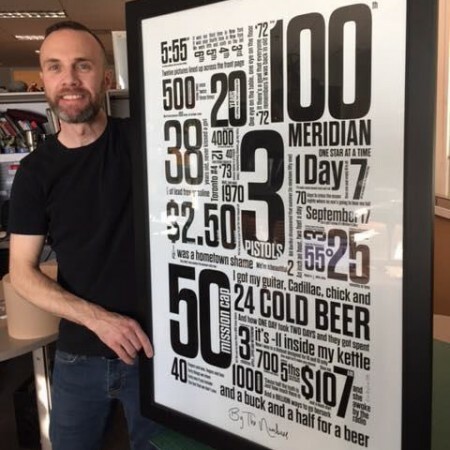 The artwork was originally released by McGuire as a poster that was sold via In Gord We Trust, a fundraising initiative for the Gord Downie Fund for Brain Cancer Research. Batches of Courage will be brewed at both breweries, and it will be released in late November in a run of just over 2000 bottles. Partial proceeds will be donated to the Brain Tumour Foundation of Canada.